As discussed in the Brain Development article, a baby is born ready to take in his world. Babies are naturally social creatures, willing and able to learn from everything they experience. As a baby or young child is exposed to the world, language is learned. Recent research has shown a direct link between language skills and intellectual development. Because a parent is a child’s “first teacher,” parent-child interaction is one of the key ingredients to successful language development. When a baby or child communicates through speech (called expressive language), thinking and learning are happening! For this to occur, he first has to receive sufficient language “input” into his brain. 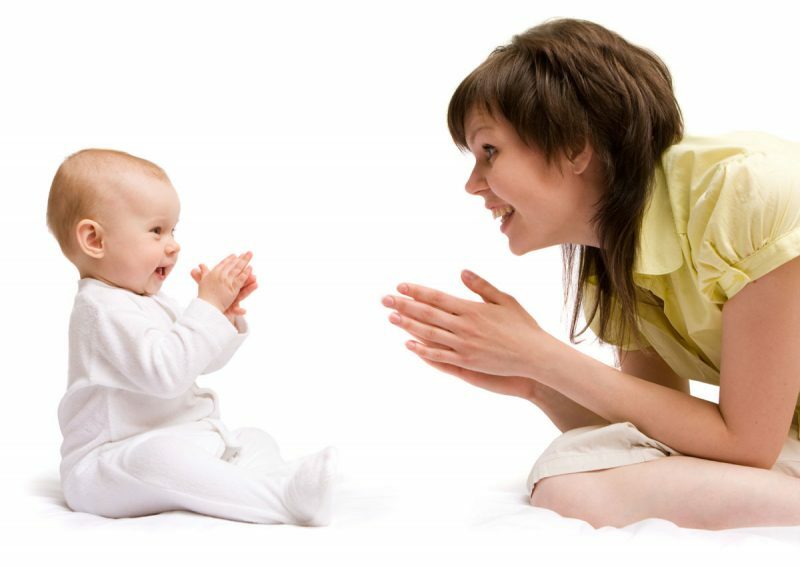 The language that a baby or child receives or learns from others is called receptive language. If there has been sufficient stimulation and language exposure, expressive language or speech should soon follow. Babies and young children understand speech long before they can talk. They are listening and learning and attempting to make sense of their world before they speak. It’s a beautiful and fascinating phenomena when they suddenly begin putting their thoughts into words! Enjoy watching your baby/child learn about his world through the magic of language and communication! Speaking and listening are the key ingredients to language learning. There are many things a parent can do to encourage baby’s language development. First and foremost, talk to him, talk to him, talk to him. A baby should be talked to, read to, sung to, and listened to. The more you talk to and listen to him the more he will attempt to communicate with you. When you talk to him make sure you make eye contact so that he knows you are listening to him. By talking to him you are also teaching him to listen to you. When you talk to him he will respond with delight as you both engage in the back and forth ”sing-song” pattern of conversation. He is learning with every exchange as you respond to him with genuine interest and excitement. Talk to your baby about everything you do, ie., “Mommy is washing her hands.” “Look (while pointing), there is a beautiful flower growing on the garden.” Always speak clearly, repeating key words and using language that is a little ahead of his current vocabulary. Finally, it is important to note that this cadence or pattern of conversation can only be learned as a result of communicating with a live person. Television cannot accomplish this since it cannot respond to the baby or child. In addition to modeling language by talking to your baby, it is important to expose him to a variety of people and settings. This change of scenery both stimulates him and exposes him to a mecca of language learning opportunities. He will learn both communication and social skills by interacting with people in the grocery store, doctor’s office, hair salon, restaurants, etc. Frequent interaction with other babies/children in play groups, preschool, mommy and me classes, daycare, etc. is also very important. Finally, the acquisition of language skills can play a vital role in a child’s intellectual, social and emotional development. Good communication skills can help a child feel successful in many ways. The ability to communicate will make him feel important as he receives instant gratification for his needs. In addition, he will receive praise, make friends easily (and keep them) because he communicates with words, not actions, (ie., hitting–often seen in frustrated children with weak language skills). When a child develops the “gift of communication” a whole new world of possibilities opens up for him!